Staten Island, N.Y., October 7 2013 – DiMarzio, Inc. is happy to announce the release of two new Titan™ humbucking pickups for 6-string electric guitars. The Titan™ pickups were designed and developed for Periphery guitarist, Jake Bowen, and his upcoming signature guitar by Ibanez. They are also available for retail sale from DiMarzio. Jake Bowen is one of the new generation of guitarists on the cutting edge of progressive rock. His sound is helping to redefine rock guitar, and his pickups play a major part. The Titan™ Neck Model pickup (DP258) is punchy and fat sounding, yet can handle multiple layers of effects without getting muddy. Jake says, “When I switch to leads, I go to the neck pickup which gives me more rounded notes and more attack. I also go to the neck pickup for cleans, depending on what my needs are”. Jake’s music often calls for ambient, clean passages as well as lead passages with lots of reverb, delay, and chorus. The Titan™ Neck Model has a balanced blend of highs, mids, and lows, and also works well for smooth, overdriven solos. Jake claims it enables him to retain the tone of his guitar as well as add a lot of effects without it getting “too messy”. DiMarzio’s Titan™ Neck and Bridge Model pickups are made in the U.S.A., and may now be ordered for immediate delivery. Suggested List Price is $119 each. 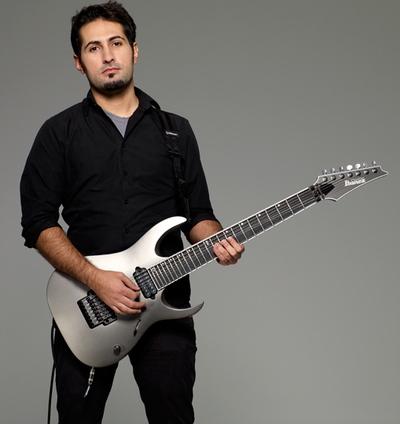 For more information about Titan™ pickups, please visit our website at www.dimarzio.com. Here’s a great video of Jake demoing the Titan pickups, and his awesome upcoming Ibanez signature guitar.